The BQE triple cantilever is nearly a quarter century beyond its design life, and to make matters worse, the wear-and-tear from 150,000 vehicles daily, road salt, and water penetration are accelerating its deterioration. Since ongoing repairs are costly, but do not address the highway’s initial design deficiencies, only major reconstruction will extend its life 50-75 years. Its reconstruction will take more than five years to complete starting in the2020s at a cost of nearly $2 billion. NYCDOT has determined that by 2026 the segment from Atlantic Avenue to Sands Street, including the triple cantilever, will no longer support the weight of trucks. If the reconstruction is not completed by then, 16,000 trucks daily will have to be re-routed onto local streets. Their diversion will create massive traffic congestion and imperil the health and safety of residents throughout Brooklyn. An implementation approach, called Design-Build, which is in widespread use nationally, would allow the project to be completed before this diversion becomes necessary and at a significant cost savings. Its use must be authorized by the State legislature, which has not yet passed this measure. A key challenge facing NYCDOT is which of the two alternative approaches to implementing the BQE Reconstruction Project it can employ: Design-Bid-Build vs. Design-Build. Under the traditional Design-Bid-Build approach, NYCDOT would hire a consulting firm to design the project and prepare a bid package, followed by a bidding phase in which contractors would submit qualifications and their bids to undertake the reconstruction. Once the contract has been awarded, negotiated and executed, construction would begin. By contrast, the Design-Build approach skips the intermediate bid process, since both design and construction are undertaken by a single entity, typically a consortium, with expertise in both areas. To ensure that NYCDOT would get a fair price, the Design-Build contract would be awarded competitively. There are many advantages to a Design-Build approach for the BQE Project. The elimination of the bid phase would save at least two years, which reduces inflationary costs. Equally important, Design-Build also eliminates the inherent conflict between the designer and the builder found in the Design-Bid-Build approach, which leads to delays due to design disputes, the need to negotiate contract changes, and the potential for lawsuits over disputes. The Design-Build approach also allows the consortium to evaluate cost saving designs by performing value engineering at an early stage of design and to more rapidly change design when unexpected conditions are found. NYCDOT has estimated that Design-Build will save $113 million on the BQE Reconstruction Project. NYCDOT cannot use the Design-Build approach without State authorization. While the Legislature has authorized eight State agencies and authorities to use Design-Build, it has balked at extending this privilege to New York City. While the Assembly passed this measure last year, it has failed to come up for a vote in the Senate despite the experience of the NYS Department of Transportation, which has used Design-Build to construct the new Koskiuszko and Mario Cuomo Bridge, formerly the Tappan Zee Bridge, in record time and at great savings. Should Design-Build legislation fail during the current legislative session, consequences for the region and Brooklyn will be severe. NYCDOT has concluded, based on careful engineering analysis, that if the reconstruction project is not completed by 2026 – which can only occur with a Design-Build approach – it will need to divert up to 16,000 trucks daily from the triple cantilever onto local streets. In addition to causing severe traffic congestion throughout Brooklyn, the trucks will endanger the lives the very young and the elderly, businesses will not receive timely deliveries, the State’s economy will suffer, increased air pollution and noise will degrade our quality of life. 2. Write or call Governor Cuomo and Legislative Leaders. Click here to sign our MoveOn.org petition. We thank our members and all local residents who attended the rally on February 9, sponsored by Senator Brian Kavanagh and Assemblywoman Jo Anne Simon. The community’s participation had a real impact in Albany by making State officials more aware of the need for Design-Build legislation. If you were unable to attend here is a link to a Brooklyn Daily Eagle article by Mary Frost. The BQE Project was the focus of the BHA’s Annual Meeting on Wednesday, February 28th which featured a presentation by Robert Collyer, NYC Department of Transportation’s Deputy Commissioner and Chief Bridge Officer. 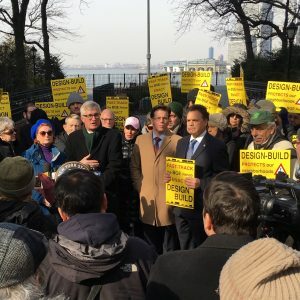 On March 6th, the BHA chartered a bus to bring a 19-person delegation to Albany to meet with key Assemblymembers and Senators to inform them of the urgency for Design-Build authorization and of the catastrophic consequences should it not pass this spring and the diversion of 16,000 trucks daily occur in 2026. The delegation included representatives from six affected communities – Boerum Hill, Brooklyn Heights, Carroll Gardens, Cobble Hill, Gowanus, and Park Slope – as well as from CHIPS and the Promenade Gardens Conservancy. While in Albany, we also met with Ali Chaundry, the Governor’s Deputy Secretary of Transportation, to convey our appreciation for the Governor’s late February letter announcing that he would support Design-Build authorization for the City on a project-specific basis, and particularly, for the BQE Project. While the Governor’s support is a promising sign, its enactment in the legislature is by no means ensured. This makes letters to the Governor and our legislative leaders, the calls to key Senators, and signing onto the BHA’s petition, vitally important actions for concerned community residents to undertake. To get this legislation passed as part of the State budget by April 1, please Act Now!